#609 - NEW DEVELOPMENT! Grand View Residence. This stunning new building project includes a total of eight to realize detached buildings. There are about 82 apartments and 22 penthouses divided (104 properties in total). All this is implemented in a high quality and durable finished entourage which includes inter alia a beautiful communal pool. The start of construction of the first phase has started 1st October 2016. In the following period a furnished Model Home will also be realized by May 2017. All apartments obviously have, such as the name of this wonderful project already suggests, a phenomenal view over the Caribbean Sea. Also, the decrease of multiple apartments and/or penthouses, one or more or all the phases or the total project belongs to the possibilities. Please contact us for an appointment to get further information about the possibilities and conditions. Grand View Residence is situated on one of the higher locations in the area of ​​Piscadera. 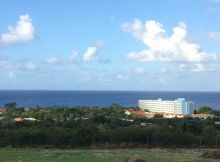 This area is very centrally located on the island and adjacent to one of the main hotel districts in Curacao, where you include the Hilton and the World Trade Center. In a 5 minutes walk only you will be already on the beach. Even the most fun and delicious restaurants are always nearby. And within a 10 minute drive only you can reach the bustling heart of downtown Willemstad. Tell me more about this property I want to visit this property! New Winds Realty is one of the largest and most respected real estate companies in Curaçao. Looking for the perfect home? Do you want to stay up-to date with our new listings? © 2019 New Winds Realty N.V.